Skype might still be in a holding pattern from Microsoft's May announcement that it was acquiring the company for $8.5 billion, but that hasn't stopped Skype from picking up a brand-new purchase of its own. 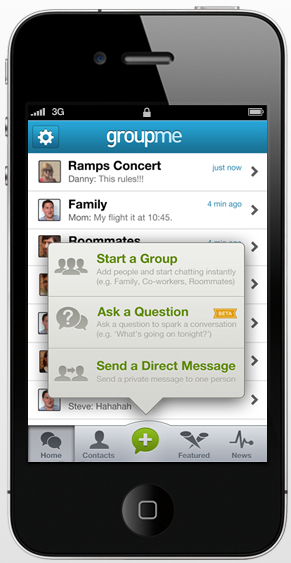 The company announced today that it is planning to acquire GroupMe, a group text messaging and conference calling service that's just a year and change into its existence. The actual cost of the acquisition and other terms of the transaction won't be disclosed, according to Skype's announcement. “The acquisition of GroupMe complements Skype's leadership in voice and video communications by providing best in class text-based communications and innovative features that enable users to connect, share locations and photos and make plans with their closest tie,” reads Skype's statement. It hasn't been that long since Kevin Rose left Digg, but early details of his new startup are already coming to light. The company, a development lab focused on solving problems using the mobile Web, is called Milk. Located in San Francisco's Mission District, it has been described as an incubator, but TechCrunch notes that the philosophy behind it is much different than the approach taken by most other Silicon Valley startups. Google took aim at Foursquare on Thursday with the addition of checkin rewards for its Latitude app for Google Maps, while replacing 'mayors' with “gurus” and “VIPs”. Google's location class warfare didn't stop there: there are a poor, middle, and elite class under Google's hierarchy, known as “Regulars,” “VIPs,” and “Gurus,” respectively. Users who check in for the first time might not receive any special designation. Users will need to update to Google Maps 5.2 via the Android Market, join Latitude, then tap “check in here” from the menu. Google said a version for the iPhone would be coming soon. The new rewards will be rolled out - where else? - at the South by Southwest Interactive (SXSWi) show in Austin, Texas this weekend, where discounts will be offered at restaurants, bars, and other venues around the downtown area. The new checkins scheme provides a sort of game-like approach to rewards, with additional checkins propelling users to new social rankings - and new discounts, to boot. “Footprint” icons let users track their progress. As an example, a restaurant could offer a free drink to a regular, free breadsticks to a VIP, and possibly a free dessert to a “guru”. Google began offering checkins on Latitude in February. The Facebook iPhone and Android apps have been highly developed and kept up to date with the latest features that the social networking site offers. However, most people around the world are not using smartphones. That's why Facebook launched a new app designed for feature phones, supporting more than 2,500 devices from LG, Nokia, Sony Ericsson, and more. The new app provides a better experience than using the mobile site, while still being viable for a lower powered device. Facebook worked with 14 carriers to offer free data usage for this app, with more coming. There's no doubt that this will bring more people to the site, especially from developing countries.